Have you ever wanted to learn the history of your home? 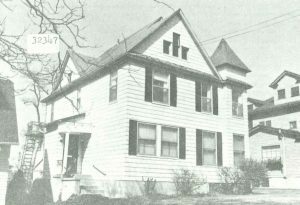 If you own a home in the Grand Rapids area, there’s a good chance the library’s History & Special Collections department has the resource for you! 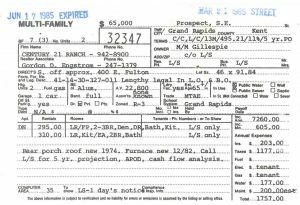 The Betty Gibout Real Estate Listing Cards Collection provides information about homes that sold (in public sales) from the 1950s through the 1990s. During that time, realtors used small paper cards when selling homes to clients. The cards (named in honor of the library staffer who, as legend holds, sorted through thousands of cards delivered in garbage bags and organized them—a task that took years!) often reveal interesting information, such as when a roof may have been replaced. The black and white photos often show interesting details like old porch awnings. This example (front and back) highlights a multi-family house on Prospect Ave (the exact address has been withheld). You don’t need an appointment, or even a library card to research your home! 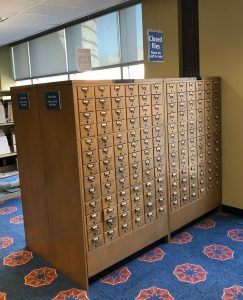 Just bring your curiosity to the Level 4 of the Main Library downtown, and let a librarian know you want to dive in to learn the history of your house.